Book now for winter 2020! Planning ahead? Bookings for Cross Country Skiing in Eastern Finland are now also open for winter 2020! Cross Country Skiing in Eastern Finland is a multi-day ski tour led by local guide, giving you the chance to experience the warm hospitality and good food of traditional Karelian guest houses along the route as well as the tranquility of the winter world in between. The region of North Karelia, which borders Russia in the east of Finland, offers a winter landscape of frozen lakes, rural tracks and forests perfect for cross country ski tours. 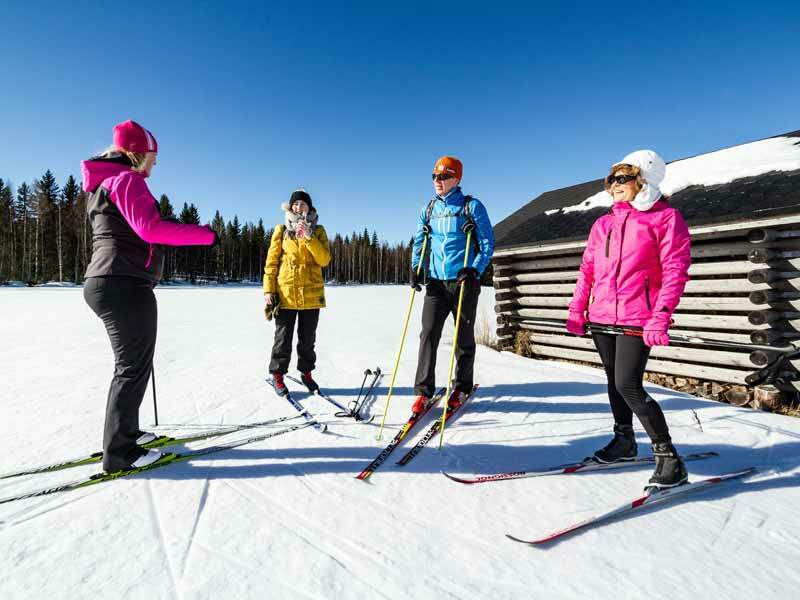 Cross Country Skiing in Eastern Finland is ideal for solo travellers, couples or groups of friends, and also for families with older children (min. age 16) with suitable experience/ability. Graded itineraries make this tour suitable for both more and less experienced skiers. Photo: AKA. Daily distances vary between 6-25km (up to around 5 hours' skiing depending conditions, not including breaks) with some days offering the option to extend the minimum distance if you wish. This experience is ideal for those with some experience of cross country skiing and in good physical condition, but who appreciate the little luxuries at the end of a day on the trail and who prefer to ski without a full pack. Your main luggage is transferred for you each day and you will ski with only a day pack, though note that the skiing on the tour can be physically challenging. Along the way, you will stop for packed lunch, hot drinks and berry juice - the forests are rich in wildlife and you may see tracks of hare or moose crossing your path. During the tour you will be skiing a combination of point-to-point days to reach new guest houses and day tours returning to the accommodation, giving you the chance to really explore the area and get to know your hosts and the local culture. 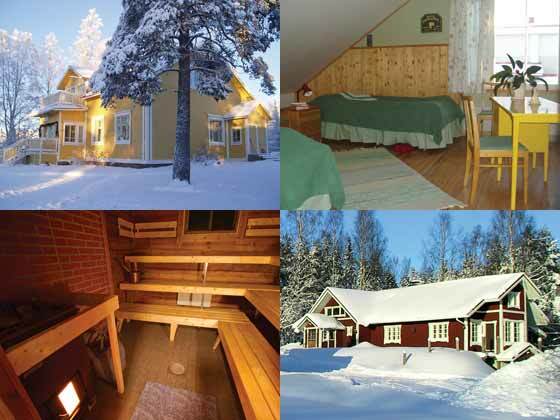 At each guest house, you have the chance to relax with a traditional Finnish sauna (the Finns love their sauna!) and, for a brave, perhaps a roll in the snow afterwards! Your hosts will serve typical Karelian cuisine, with a strong focus on locally-produced and wild ingredients including fish and game, berries and foraged plants from the forest, before you retire to recharge your batteries for the coming day. 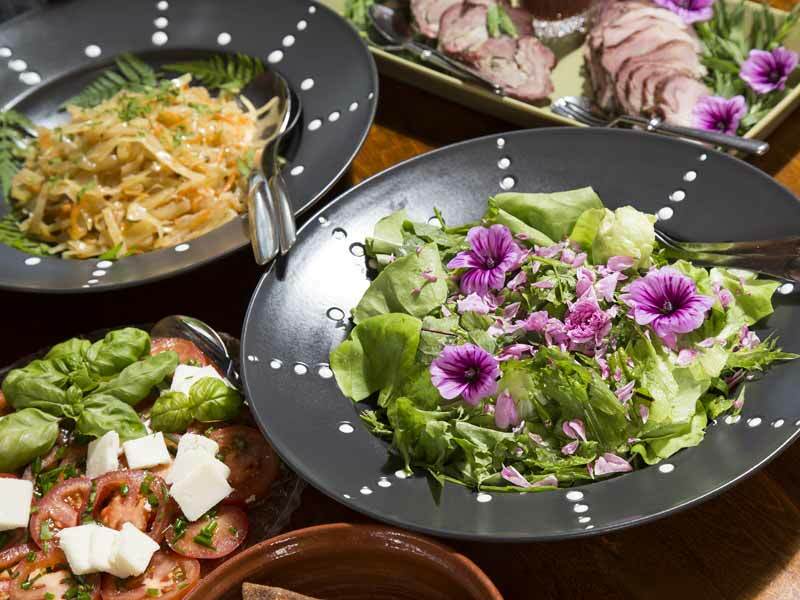 Locally-sourced, home-made Karelian cuisine is also a real feature of the tour. Photo: AKA. Standard tour dates are complemented by two introductory-level dates, making the tour accessible to participants without previous cross country skiing experience. It is, however, recommended for these tours that guests have at least some previous experience on skis, whether from downhill skiing or limited previous experience of cross country skiing. 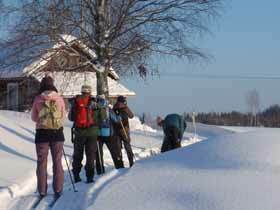 These tours begin with short instruction on Day 1 and then there's no better way to learn cross country skiing than by doing - so once everyone has grasped the basics, you start your first day tour in the local area. You begin on a frozen lake, which helps to improve your basic technique, but the real learning beings when you arrive in the forest and start practising how to negotiate hills! As when learning most outdoor activities, you should expect to fall over and get a few bumps and bruises on the way as you develop your skills. The first few days of the tour are at fixed guest house base, giving you the chance to gain confidence and improve your fitness and technique. Your tour culminates in a 3-day/2-night trip staying at two additional overnight locations - by the end of the week, you should be able to ski up to around 25km! The Discover tours also gives you the chance to try different types of sauna during the tour, as well as having strong focus on local food traditions as for standard tours. For Discover tours, ski equipment is included as standard. For guests arriving by flight, there will be a transfer from Kuopio airport at 18.00 (meeting flight arriving 17.50), from where it is approx. 110-150km (depending on tour itinerary chosen) to your guest house accommodation for the night. Guests arriving by train to Nurmes will be collected from train arriving 20.06 (transfer time approx. 30 mins). Check-in and dinner at the guest house and a chance to get to know the other participants in your group. NB: The tracks on which you will be skiing are nature tracks prepared in advance by snowmobile. During windy conditions, track quality may vary. On days where distances are shorter, in some cases these distances can be extended if you wish with extra loops. Issuing of equipment and a chance to become accustomed to your gear on a day skiing tour around Paalajanvaara in the afternoon, distance max. 11km, before returning to the guest house for dinner and overnight accommodation. The main tour begins! 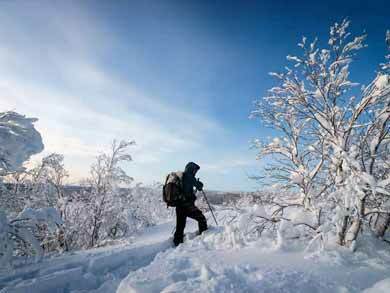 Today takes you 22km through snow-covered forests, over fields and across frozen lakes. You stop to grill sausages by the campfire before reaching Laitalan Lomat guest house for the evening. This day features a 15km tour on the Lomat ski track, returning to your accommodation for overnight. Today's skiing offers varying terrain as you cover 25km towards Pihlajapuu, your goal for the day, pausing along the way at a farmhouse to meet some real locals! You reach Pihlajapuu later in the day, where you will stay for the rest of the tour. 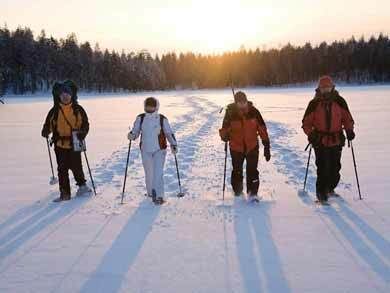 A day's cross country skiing tour (distance variable 15-20km) from Pihlajapuu. If you wish, it is possible to arrange a massage to soothe tired muscles (additional payment made locally)! A day tour to Nälkömäki, distance approx. 20km. In the evening, you can experience a "smoke sauna" at Minna's followed by a dinner of glow-fried salmon. NB: The tracks on which you will be skiing are nature tracks prepared in advance by snowmobile. During windy conditions, track quality may vary. 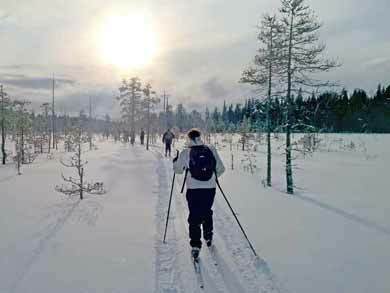 Over three days, you will begin to develop your cross country skiing technique and fitness with lessons and day tours in the surrounding forest. Day 2 covers approx. 5-8km followed by a honey sauna and herbal foot bath in the evening to soothe tired muscles! Day 3 increases the level of challenge a little, covering approx. 10-12km and ending with a peat sauna in the evening, while Day 4 brings the distance up to around 10-15km, rounding off the day with a smoke sauna! Accommodation for the first four nights of the tour is at Pihlajappu, the location of the guesthouse normally used for Day 5 and Day 6 of standard tours. You should by now feel more confident and capable of covering longer distances. Today you leave for the first point-to-point component of the trip, skiing approx. 25km towards Laitalan Lomat (the accommodation normally used for Day 3 of standard tours), where you overnight. As Day 4 for standard tours, this day features a 15-16km tour on the Lomat ski track, returning to your accommodation for overnight. Your last day of skiing, changing location to cover approx. 21km to end your tour at Puukarin Pysäkki, the location normally used for Day 1 and Day 2 of standard tours. Your experience ends with a special Karelian buffet in the evening to congratulate each other on your new skills! Breakfast and transfer at 12.00 to Kuopio airport for flight departure 14.30 (except for tour 9th-16h March 2019, for which transfer will meet flight departing Kuopio 11.35). Guests departing by train will be transferred to Nurmes (for train departing 15.40 - depending on arrangements, guests may be transferred to Nurmes earlier to spend time there before train departure). NB: Prices based on two persons sharing. Supplement applies for single occupancy. Hire of ski equipment is not included for Standard tours. For Discover tours, ski equipment is included. Ski equipment: NB: For Discover tours, ski equipment is included as standard. Skis, boots and poles. Please advise height, weight and shoe size in advance. Ski equipment provided are normally waxed Madshus skis. Depending on requirements/sizes, skis may also be Finnish designs such as Karhu or Peltonen. If you wish to bring your own boots but hire skis and poles (this does not affect the price), please let us know what type of boots you have and whether you require Salomon SNS or Rottefella NNN fittings. Guests bringing own skis should ensure that ski width does not exceed 45mm, which is the width of the prepared track. Extra night in guest house/Airport transfer: You are welcome to add additional days before and/or after your tour if you wish, for example if you would like to do some self-guided skiing in the area before the tour begins. However, please note that airport transfer is not included in connection with these extra days (guests arriving/departing by train can be transferred at no additional charge). Includes accommodation, full board and ski equipment hire. Airport transfer price applies per group for up to 8 persons. Double/twin rooms in guest houses along the route. Single occupancy supplement applies for solo travellers. All guest houses have shared WC/shower facilities. Wood-fired sauna is available each night. Bedding and towels are provided. To reduce environmental impact, bed linen is transported between overnight locations with the luggage transfer. Fresh towels are provided at each new overnight location. All meals from dinner Day 1 to breakfast Day 8. There is a particular focus on local produce. Please let us know any dietary requirements on booking. Ski equipment (skis, boots and poles) is included. Please provide height, weight and shoe size in advance. NB: For standard tours, ski equipment is available to hire as an optional extra. Group transfer from Kuopio airport at 18.00 and Nurmes train station at 20.00 on Day 1. Transfer to Kuopio airport for flight departure 12.00 and to Nurmes train station for train departure 15.30 on Day 8. Please note that airport transfer for guests adding extra days is not included (see under "Optional extras"). Ski equipment (Standard tours only - available to hire as optional extra). NB: For Discover tours, ski equipment is included. Standard tours are suitable for adults (or families with older children aged 15+) with good level of fitness and previous cross country skiing experience and who are comfortable skiing distances of 15-30km per day with light pack. The skiing on this tour can be physically challenging. Standard tour dates are suitable for participants with an intermediate or higher level of previous cross country skiing experience comfortable with daily distances up to approx. 25-30km. Discover tours are ideal for guests who have at least a little previous experience on skis (e.g. from downhill skiiing or limited cross country experience). In general the tour is not suitable for guests for whom the tour will be their first time on skis of any kind. Note that these tours can also be physically challenging and guests should have a general good level of fitness for this option also. You should be prepared for some falls, bumps and bruises as you're learning! Accommodation is in comfortable guesthouses and, as luggage transfer is included, you will need to ski only with a daypack during the day. However, trail/snow/weather conditions as well as the efficiency of your skiing technique can significantly affect the actual level of challenge. The Standard and Discover tours have no minimum and are guaranteed to run from the first booking. Maximum 12 participants. Groups may be made up of participants from a number of countries - English and German are the languages used for guiding. All accommodation for this tour is small-scale and locally-owned. The great majority of food served on the tour is home-made using locally-sourced ingredients. Fly to Helsinki for onward travel to Kuopio by domestic flight (1 hour) or day train to Nurmes (just under 7 hours). Transfers at fixed times between Kuopio airport (2 hours) and Nurmes train station (30 mins) and the start/end guest houses are included. Train from UK to Stockholm (Sweden) for ferry to Helsinki and onward train to Nurmes. Compare our range of ski touring and cross country experiences. We also offer a summer version of this tour by bike and canoe. This experience was voted "Finland's Best Food Tourism Product" in the 2015 Hungry For Finland competition from 77 entrants!